Thunderbirds Are Go is the first and by far and away the better of the two International Rescue films - for starters it has a good plot, albeit padded out with a bizarre [but oddly enjoyable] musical interlude. The set-up of the mission to Mars, the accidental sabotaging of the first attempt to launch Zero-X towards the red planet, International Rescue's involvement and the final race against time are all splendidly handled. The script contains some crackling dialogue and a few funny lines for Parker, the music from Barry Gray is splendid and the model work still looks good... even after all these years. The fact that the film unexpectedly failed at the box office isn't really of much consequence so long after the fact; what's important is that it largely holds up as a solid bit of vintage fun. If you like Thunderbirds the TV series you'll like this, too. 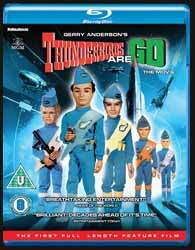 The trouble is that if you like this movie you'll have possibly picked up last year's widely imported Twilight Time release, which combined Thunderbird Are Go and Thunderbird 6 onto the one disc along with a bundle of extras. Sadly, the only additional material that failed to make the US Twilight Time cut [it went out under a different label in Germany] is a short interview with Gerry Anderson during which he retells some old yarns that have been heard many, many times before. And rather annoyingly, this 'Countdown to Thunderbirds' feature appears on the Fabulous Films release of Thunderbird 6. Why? The remaining extras are a mixed bag - the photo gallery is a mess - but the commentaries and other assorted odds and ends are quite jolly, which combine to create a pretty well-rounded release. It's almost 50 years since the world first marvelled at Thunderbirds Are Go and it's still a jolly romp.